Changes Ahead For Commuter Lot? A new bridge over the Saugatuck River, and a new look for Railroad Place, are not the only changes being considered for the area near the train station. 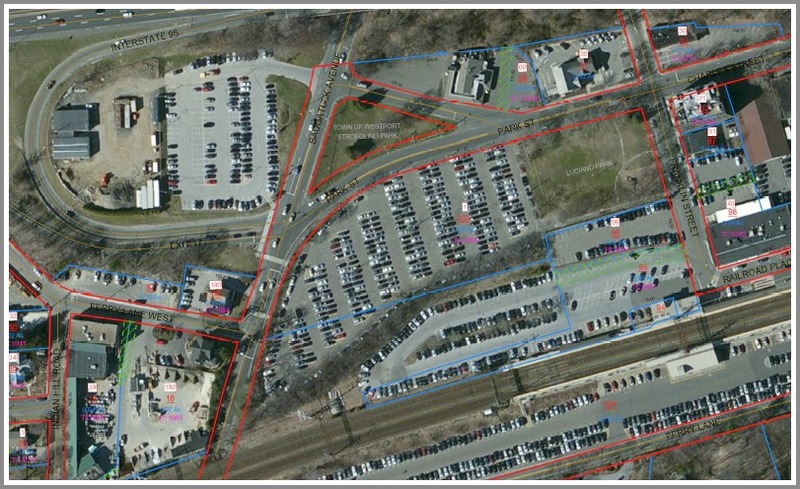 This Tuesday (June 7, 7:30 p.m., Town Hall), the RTM will consider a proposal to redesign train station parking lot 1. That’s the area adjacent to Luciano Park, directly opposite the old Blu Parrot/Jasmine/Arrow building. An aerial view of train station parking lot 1 (center). Luciano Park is the green area on its right. The state-owned lot near Exit 17 is on the left. The lot is owned jointly by the town of Westport, and state of Connecticut. It’s in poor condition, needing repaving, re-striping and flood mitigation. The redesign addresses those issue — and provides improved lighting, more electric car charging stations, a new pedestrian staircase, partial sidewalks, new crosswalks in the lot, and plenty of trees. It’s estimated that the reconfiguration would reduce the lot’s capacity from 320 to 310. Earlier this week, the RTM Transit Committee voted on the proposal. They deadlocked, 3-3. This entry was posted in Police, Saugatuck, Transportation and tagged Jennifer Johnson, Saugatuck train station, Westport RTM. Bookmark the permalink. Just what we need, fewer parking spaces and longer exit times. Julie Van Norden — You are spot on. Write: RTMMailingList@westportct.gov and come Tuesday night to Town Hall and lend your voice as a citizen to the debate. This will go forward unless the RTM hears loudly and clearly from the commuters. Billy Scalzi– I am on the RTM and I voted against it at the Transit Committee. We need your voice and your support if we are going to get the Plan revised. Write: RTMMailingList@westportct.gov and come Tuesday night to Town Hall and lend your voice as a citizen to the debate. They can simply fill the potholes and build the staircases without eliminating all the exits, at a significantly lower price. We need to take the time to get this right, instead of marching forward before the plan is tweaked and improved. Reduce the entrance/exit points to one? Create less parking spaces? Dan, April Fool’s is not for quite a while. Cut this story and reissue it 4/1. Anyone know why on earth regulations would require *fewer* exits? Can’t imagine what the warped logic is on that. I just guessing but I would imagine the town/state has regulations preventing private developers from putting in excessive curb cuts from private parking lots in the interest of minimizing disruption to traffic flows on primary roads. Something like that would seem perfectly reasonable to me. Its not a private lot, its a public one, which would or should require different reasoning. But yes, something akin to that is probably right. Thanks. For instance, why not allow Stop & Shop to eliminate the buffer to the Post Road but instead run the parking lot up to the edge with each row being able to enter/exit directly? “Increased exit time”?! … we are already dealing with significantly increased exit time from the general area caused by all the development close to the bridge in the last few years… they have to be kidding or in dream land! Feels like no one is thinking through the impact of all these projects on traffic flow in town. If there has been no competitive bidding, why not? It is hard to believe this project, or any other project of significant size, would be undertaken without competitive bidding. Is the state taking the lead in this project, or is Westport? Kristan thanks for being a leader and voice of reason at the RTM on this issue. I’d like to understand the rationale of the RTM reps who support this, because I can’t think of a sane reason to do so. The right solution is for the town to simply fill the potholes and pave the lot – and do it now. That would delight all of us commuters and save $1MM for better use. Thanks for the detailed response but I’m stuck on this point. Are you saying this did not go to bid? We agreed to1. 5 million and now we will go to bid?? Like everyone that I have talked to who uses the lots, the proposed plan makes little sense. The traffic conditions around the train station at peak hours need to be addressed and this parking lot plan only makes it worse. 1. Parking Lot 1 must have more than one entrance/exit. A logical flow must be engineered to handle so many cars at peak hours. 2. The intersection at the entrance to I-95 needs to be re-thought and crossing walks clearly labeled and WELL LIT for a logical and safe flow from that overflow lot to Lot 1 and then on to the train station. With the current setup it is only a matter of time before a commuter is killed. An obvious improvement would be a lighted crosswalk system. Please take a holistic view to the traffic and parking needs of the area and not jus the immediate need of repaving Lot 1. …learned years ago that you never put the 1st number out because that’s where your opponent/contractor/consultant negociates from, not tries to meet. Amen, Stephanie. Good old fashioned common sense! …so why didn’t the RTM use good old fashioned common sense? This is not their 1st rodeo; and I sincerly admire everyone who volunteers for these committees and gives so many hours to handle governing the town. I have no patience and can only operate as a one person band, so I leave this work to others. But the community has an incredible amount of sophisticasted business people, who must be good in their fields if they can affort to live in this town. Isn’t there a process/template/or protocol that is always used in these situations? This is either the stupidest idea ever or the front end of a plot (yes, plot, as in conspiracy) to make Lot 1 so unusable that a garage becomes inevitable. And that is n even worse idea. I’d attend the RTM meeting at 7:30 — but at that time I’m usually stuck in traffic TRYING TO GET OUT OF THE PARKING LOT! Another project dreamed up by beaurocrats with high price tags to do something no one asked for and while at it make life more difficult for those that use the facility. The Compo beach renovation comes to mind which was greatly curtailed when common sense prevailed. Pave the lot and make new stripes. Fix the ever crumbling pedestrian steps. All great ideas. But leave the exits as they are and work to add spots not remove them.